Leaping Lions! This cozy mystery giveaway is grrreat! Hi there, cozy mystery lovers, for Ellie Campbell (and hopefully the rest of you) 2018 is already starting with a roar. We have a fantastic giveaway for you below but first a little update on our eventful, often crazy, lives. No sooner were the Christmas decorations put away than Pam (confirmed non-skier) was off to Val D’Isere with the family, visiting her chef son Alex in the French Alps, experiencing snow, blizzards, dog sledding huskies and all the dangers of some luscious French cuisine. Meanwhile Lorraine was fulfilling a lifetime dream of a Tanzanian safari, tenting it under starry African skies, cruising in an open jeep through Tarangire National Park, Ngorangoro Crater, the Serengeti and Ruaha, snapping photos of lions, wildebeest, zebra, giraffe, antelope and of course elephants. The big boy above decided our Land Cruiser was going to move or he was coming in the vehicle with us! He literally could have touched us. And of course there was no strolling far from our tents at night for fear of meeting these handsome but deadly characters What do they have in common with our cozy mystery giveaway? Well, they may all look like pussycats but you never know when one of them will turn into a natural born killer. 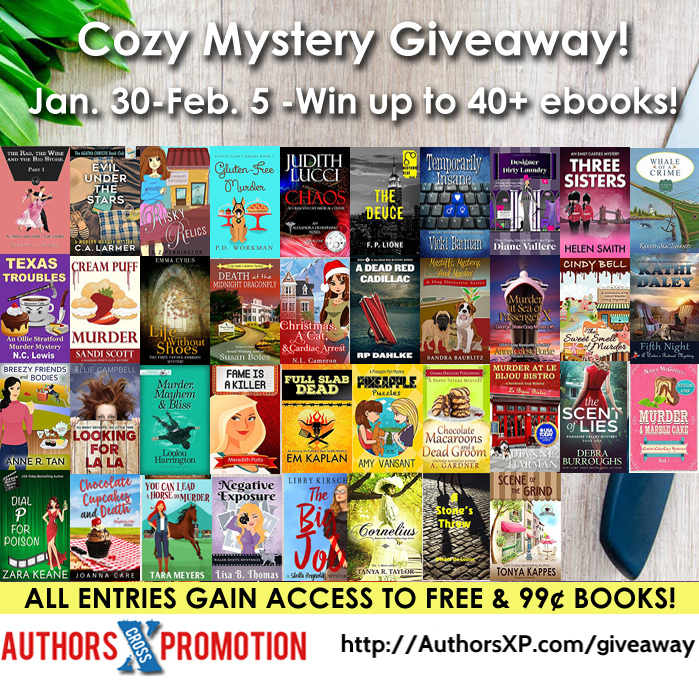 Win up to 40+ Cozy Mystery eBooks! Novels by #eNovAaW Bestselling authors up for Grabs! Pam is a pescetarian and eats salmon and sweet potatoes almost every night. Mainly because it only takes two minutes to prepare and she can’t be bothered thinking of anything different for herself. She will however happily burn a variety of meals for the rest of her family. The best present Lorraine ever got was when her husband’s friend gave her his Arabian horse Sylvarr. Lorraine’s husband is still cursing the ‘free gift’………..
Pam wants to own a horse again one day but of late has had to settle for the rear end of a tandem. Lorraine is visiting Pam on the way to a wedding in India this Spring. She will only be at Pam’s for one night and half a day. Lorraine hates exercise of all kinds, but did once walk the West Highland way. 100 miles. All uphill. Pam hates exercise of all kind but she has somehow found herself signed up with a group of long distance challengers to cycle on the back of husband’s tandem from Biarritz to Barcelona. A distance of approximately 600 kilometers. She is dreading it. Especially the Pyrenees mountains in between. Today Ellie Campbell is giving away a copy of Looking for Lala to one lucky winner, everyone is welcome to enter. International entries can choose an eBook copy, US can choose Ebook or paperback. To enter please fill in the Rafflecopter. Ellie Campbell says: Thanks for featuring us on your Saturday Spotlight, Tina! Click on the link below to enter the giveaway for LOOKING FOR LA LA. 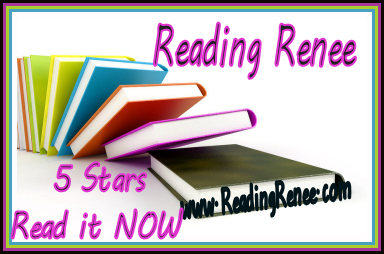 via TinasBookReviews: The Saturday Spotlight with Ellie Campbell and Giveaway of Looking for Lala. January – My sister Jo is visiting from Ecuador along with her son Ben who lives in China. Lucky for me because they help cook meatballs, sausage and peppers and a roast turkey for our annual New Year party of 150 people at husband Gary’s office. Of course I have to take my visitors to our local cowboy dance hall, the Grizzly Rose, and of course we all have to ride the mechanical bull. Then off to Indianapolis for Auntie Annie’s 90th birthday, driving back to Colorado with Gary’s new car. The next weekend another flight to New Orleans for a wedding. I don’t remember much of it beyond throwing mardi gras beads at innocent bystanders from a balcony on Bourbon Street because in between partying, I fall sick with a killer flu and apparently alcohol, antibiotics and codeine cough medicine don’t mix well. This is a bug that lasts for weeks. Meanwhile Pam and I have made the bold decision to try our hand at self-publishing with not one but three books, Looking For La La – our latest novel – and our first two, How To Survive Your Sisters and When Good Friends Go Bad, which have never been published in the US. Suddenly emails are flying about, demanding edited copy, blurbs, permissions to use old jacket covers. Needing a cover for Looking For La La we decide to go with Design For Writers. And, boy, will we be glad we did. Pam buys a new paperwhiteKindle and experiments with her first two tweets on Twitter. February – Still suffering from flu, pneumonia, whatever. Anna Twinney of Reach Out To Horses – with whom I did an intensive horsemanship course last year persuades me that in between preparing three books for publication, I have plenty of time to complete her trainers’ course this year. This means I need 20 case studies done by exam time in November. My first is an off-the-track thoroughbred who had a bad experience with ahorse trailer and has to be persuaded that loading again will not kill him. One down, nineteen to go. Meanwhile Pam’s flying with her family to visit Jo in Quito, popping into Peru on the way there and the Galapagos on the way back (wondering if she can fit this into writing expenses – don’t be surprised if our next novel’s not set there). In our Ellie Campbell mode we’re struggling with the technicalities of putting Sisters and Friendson Kindle, writing strap lines for La La, taking part in a Valentine’s Day week of fun questions with best-selling author, Michele Gorman and 11 other fabulous women fiction writers. Oh, and a skunk seems to have taken residence under the cabin. But we do have a great new cover for Looking For La La. March – Off to Indianapolis for Passover with Gary’s family. I also start working case studies at two horse rescues, Zuma’s and Shiloh Acres, both over an hour from home. La La is available in paperback for the first time ever and Friends and Sisters are published in US. Our agent tells us we need more reviews and web presence to be eligible for Amazon promotions. We do? Duh! We are so green at this game. We create a new website – Chicklitsisters.com, get an Ellie Campbell Gmail account, and start feverishly contacting bloggers and reviewers. April – Leave for Connecticut for my first ROTH trainer’s clinic – foal gentling, working with rescued nurse foals who have been motherless almost since birth, teaching them to trust people, to accept a halter, grooming, to be led, wear a blanket, go through an obstacle course. When I get back my friend and I add two mostly untouched Arabs to the rota of horses in training, hampered by the fact we are suddenly knee-deep in snow. On the La La front, we now have 36 reviewers and bloggers who want to feature us and more in the pipeline. We have to write guest posts. Help! Pam slinks off to Budapest but thanks to Skype and email, she can’t escape and has to help. Our German publishers make us a bookclub offer for the German translation of Friends, or rather Freundschaftsspiel. Luckily we don’t have to do anything apart from agree and sign. Yippee. May – Unseasonable amount of snow – will it ever stop? Pam stumbles across information about KDL free promotions in an author chat group. She decides to tie one in with Mother’s Day with about two days’ notice. I have another flu virus but that doesn’t stop the frenzy of spreading the word. La La gets into the top 12 of Amazon free books with over 10,000 downloads in a weekend. Oh and Gary has knee surgery. The snow continues slowing our horse training progress. I should have bought those studded snow tires after all. June – Spring arrives – or is it summer? Volunteering to assist at a 3-day ROTH clinic in Littleton, watching participants work horses in the round pen and obstacle course. Oh and I decide to bring a shy, terrified young horse, Avery, home from the horse rescue to gain his trust – just for two weeks, I promise Gary. Pam’s away for a long weekend, supporting a group of charity fundraisers cycling from Redhill to Paris, just thankful she’s not been bamboozled into cycling herself. Her husband decides he’d like to do the 175 miles in 24 hours, so Pam’s cooking breakfast for groups of 30 at a time at 5.30 am. Meanwhile thanks to our reviews and friendly bloggers, La La gets selected for an Amazon UK promotion and starts moving up the paid charts reaching #3 in humour. Hooray. It is now officially a best-seller! July – Off to Lake Powell for our annual houseboating trip and then back to Connecticut again, this time for a colt starting clinic, training two and three year olds to accept a saddle and rider for the first time. Pam’s unfortunately not been able to get away with avoiding the next cycling charity challenge – 500k to Copenhagen in 4 days – on the back of a tandem. Meanwhile back in London my nephew Anthony has a premier of his movie Mistaken and we do another KDP promotion of Looking for La La, jumping up the rankings from 121,000 to #1 in US free charts in five days and #38 in paid. August – Pam arranges a holiday to visit our old haunts in Skye with my two sisters, nephews and nieces. 90% holiday but also research for our 5th novel (still to be published). I go to Wyoming for a mustang gentling clinic and see my first moose on the way there. We visit the wild mustang herds and work to gentle mustangs and some feisty untouched Paso Finos. A day after I get back, Pam’s daughter visits with two friends. And Pam wonders why I don’t get any work done! Also my elderly Arabian has his third eye ulcer of the year and we are in the middle of yet another book promotion. Plus we’ve got attached to the young colt, Avery so it is obvious he’s never leaving. Somewhere in there we are also working on our new novel. September – Off to Las Vegas and Los Angeles with Lucy and two friends. They head for Moab when we get home and suddenly Boulder is flooding, creeks turning to raging torrents, people killed, others losing their homes or having them filled with four feet of water or – worse – sewage. Our power dies just as I get the call for an emergency evacuation at two a.m. Don’t want to leave the horses, cats, dog, etc. so decide to stay. Our house is unscathed but the rental properties Gary manages aren’t so lucky. Meanwhile at Zuma’s horse rescue, four foals and two highly defensive ‘wild’ mares are saved from a kill auction and given to us to gentle. October – A week of ROTH trainer’s exams with colts to start, problem horses to train and a final demo day of the methods. Not to mention the panic of finishing and writing up the case studies of horses I’ve been working with all year. I have three fellow students staying with me, two from Sweden, one from Nigeria. Meanwhile we are also doing final edits of the follow-up toLooking For La La and trying to decide a title both for the book and the mystery series. November – Off to Mexico to the small village of Yelapa by Puerto Vallarta for a week. Two people get stung by scorpions while we are there – but none of our friends, luckily. 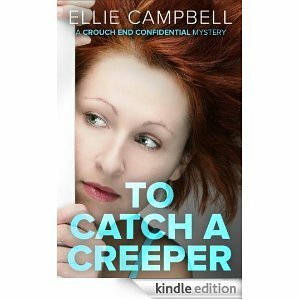 On the book front we commission a cover for our new novel – again from Design For Writers – and decide to call it To Catch A Creeper. Oh, and we have 26 people for Thanksgiving Dinner. And more blurbs and promotional copy to write. December – Ah, the joys of Christmas. Our first year as indie authors almost at an end with us, leaving us so much wiser and familiar with the ways of Facebook, Twitter, Pinterest, Good Reads, etc. etc. We have now made friends with so many fellow authors and bloggers and reviewers, it’s hard to keep up. But what an awesome bunch. I am now a certified ROTH trainer and still volunteering at horse rescues. ‘Ellie Campbell’ is preparing once again for the launch of a new novel. I have 25 people sitting round the fireplace singing carols at Christmas, horses and dog out frolicking in the snow. And of course food to cook for the business/friends annual New Year party. Meatballs anyone? Lorraine is one half of Author duo, Ellie Campbell – a pseudonym for her and Sister, Pam who collaborate across the mighty Atlantic from their respective homes in Surrey, England and Colorado, USA, finding writing together a great excuse for endless phone conversations. Together they have written four novels How To Survive Your Sisters, When Good Friends Go Bad, Looking For La La and To Catch a Creeper. They love any chance to connect with their readers. Ellie Campbell is represented by the Hardman & Swainson Literary Agency. 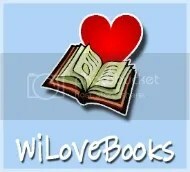 For further information and to get in contact with them please visit their website: www.chicklitsisters.com. via Guest Post & Giveaway: A Whirlwind Year : Me, Bookshelf and I.
via Book Review/Giveaway-When Good Friends Go Bad-Ellie Campbell (US, CAN, UK)-Ends 8/15 | Miki’s Hope. National Friendship Day… yes, we're at it again. We had so much fun last weekend with the kindle promotion of Looking For La La (41,500 downloads and reaching #1 in the Kindle Top Free 100) that, hey, we’re going to do it again. It’s National Friendship Day in America this Sunday, August 4th and we all know there’s nothing more valuable in life than our friends. To honor them and to celebrate the long-awaited launch of How To Survive Your Sisters and When Good Friends Go Bad on the US market – complete with stunning new covers by Design For Writers – we’re holding a three day FREE download weekend of When Good Friends Go Bad for US readers – again through Amazon.com. Of course we know YOUR friends would never go bad but that won’t stop you enjoying the novel Chick Lit Reviews and News called ‘outstanding… unique… a fabulous read.’ (To learn more, click here.) When former friends reunite, there’s intrigue and mystery, laughter and betrayal, the agony of discovering a long-lost true love when it’s plainly too late, the knowledge that your old friends know you best of all… and the inescapable truth that inside the most staid or sophisticated of grownups lurks the wild or awkward schoolgirl of their youth. Don’t let that put you off – Amazon provide free Kindle apps for your smartphones, iPads or computers. And La La wins… Amazon.com #1 bestseller! FABULOUS NEWS! Our Free Download Weekend for Looking For La La was a huge success – much better than anything we could have hoped for. Number One in the Kindle Free Top 100. Over 40,000 downloads in three days – that’s enough new readers to fill an America football stadium! Thanks so much to all the lovely people out there who blogged, tweeted and best of all downloaded. We hope you’ll enjoy reading Cathy’s misadventures as much as we enjoyed writing them. We’ve just got our first review from the Kindle promo and – whoopee – she loves it! It’s the greatest feeling in the wolrd when people like your books… I don’t know why but it always takes us slightly by surprise. So keep those reviews coming… some authors claim never to read them but we love ’em! Thanks again, so much for helping make this promotion such a success.